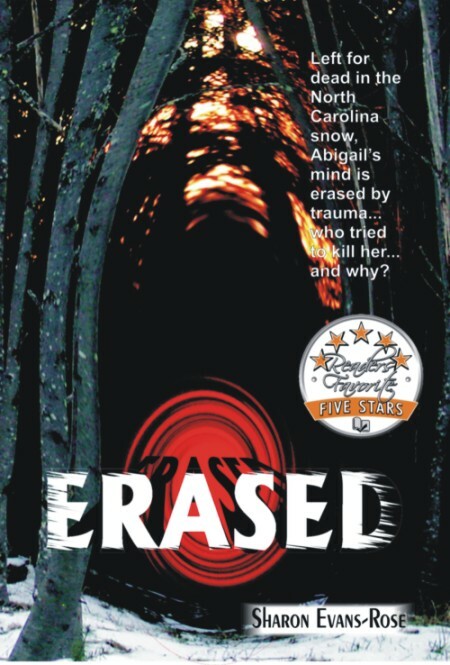 A novel full of intrigue and unsuspected twists; Erased is definitely a page turner that leads to an unforgettable ending! She opens her eyes. The pain is intense. Where is she? Who is she? Left for dead in the snowy mountains of North Carolina, Abigail has no idea of her surroundings. Who shot her? Who wants her dead…and why? A raging nor ‘easter has blocked the roads and she finds herself being cared for in a cabin owned by a kindly stranger. Abby is struck by the realization she has lost all memory of her past. She has knowledge of nothing before this day and has, in essence, been erased. When the storm abates, her rescuer takes her to his home to recover and remain out of sight. The return of her memory is essential in uncovering the identity of the villain. Her quest for awakening her past leads her to uncover deception, unfaithfulness and betrayal. A novel full of intrigue and unsuspected twists; Erased is definitely a page turner that leads to an unforgettable ending! “Erased” by Sharon Evans-Rose is a kind of thriller that will keep the reader spellbound right to the end. When Abigail Cummings discovers that her husband has not quit cheating on her, she not only tells him to pack his things and get out, she also fires him from the business. After all she owns it; he had only just married into it. That same day Abby disappears and is left for dead in the North Carolina mountains in the middle of a raging snowstorm. Rafe Adams just happens to be at his cabin for the weekend when he comes across Abby lying in the snow. As a doctor he knew she was severely injured, and to top it off, when she comes to she has no memory of what happened, who she is or who would have wanted to kill her. Now the mystery deepens as she tries to recall events and stay safe with Rafe’s help till they discover what happened. The fascinating mountains of North Carolina have drawn people to their mysteries for eons. The commercial hustle and bustle, the vibrancy of different personalities of the residents and their creative spirit combine to give this region a flavor all its own. Sharon Evans-Rose was introduced to the area through the North Carolina School of the Arts in Winston-Salem when her eleven-year-old daughter was the recipient of a ballet scholarship. Images from time spent there became the perfect setting for Erased. A native West Virginian, Sharon Evans-Rose’s interest in the Arts began at an early age with her fascination of creating her own paper dolls. Dance lessons, both locally and in New York City led to several years of performing professionally as well as designing and creating costumes. Also a talented artist, she has won numerous awards for her water colors. She and her husband, Jerry Rose, created their own School of Dance and their talented graduates have performed on Broadway, in Las Vegas, at Disney World, on cruise ships, with major dance companies, some teach college and several now have their own studios. Sharon’s desire to write rested in the back of her mind, nudging repeatedly throughout her busy life. She finally was able to create the time to write this novel and Erased is the first of many stories she holds ready for publication. Sharon lives in Beckley, WV with her husband, Jerry and has one daughter, Heather, a son-in-law Shane, and is devoted to her grand-son John.